In light of a nice little "road trip" that my Dad and I are planning for early next week... 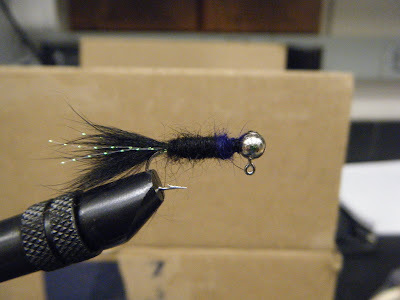 I thought I'd do a short post regarding steelhead. 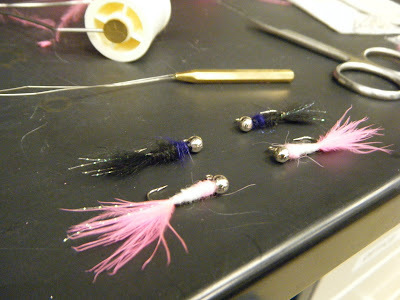 Often times, when drift-fishing for steelhead, we use small jigs (usually tipped w/ bait) and run them underneath floats. If you have never experienced this type of fishing, you should know that it can become a very exciting (almost addicting) experience watching your float drift downstream through a good run of fish--knowing that at any moment a big girl could slip up and take your jig... Unfortunately, I haven't done much steelhead fishing the past couple of years, but believe me when I tell you this is one of my favorite types of fishing. 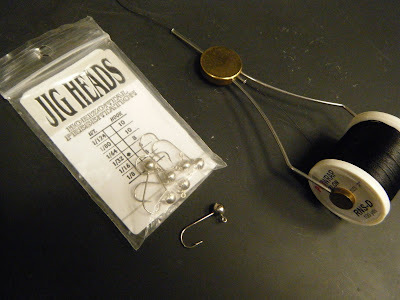 In this entry I'd like to share with you a very simple, yet effective method of tying steelhead jigs. This is a pattern that I have been tying for quite a few years now and have found it effective on both the Erie and Ontario tribs. 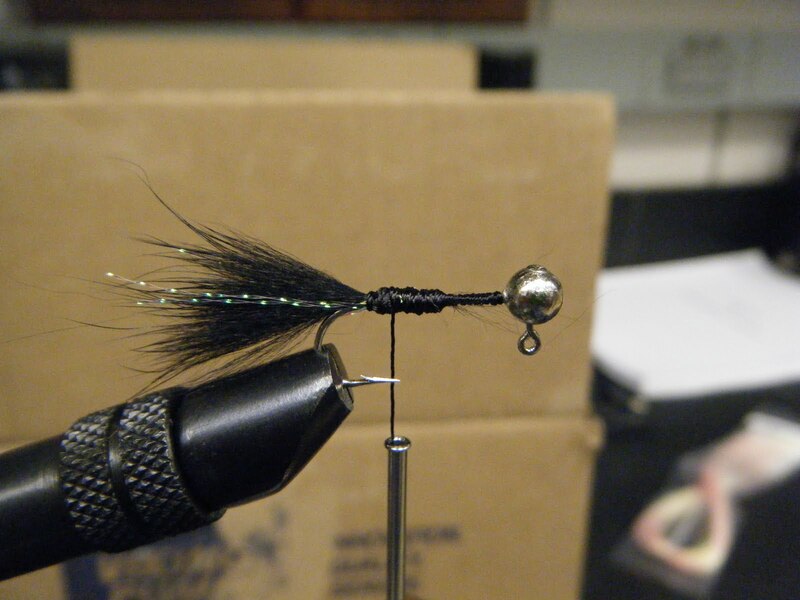 First, you'll need some tying supplies and a few small jigs (with no collar)... These are 1/32 oz, but you can use smaller or larger for the conditions you fish. 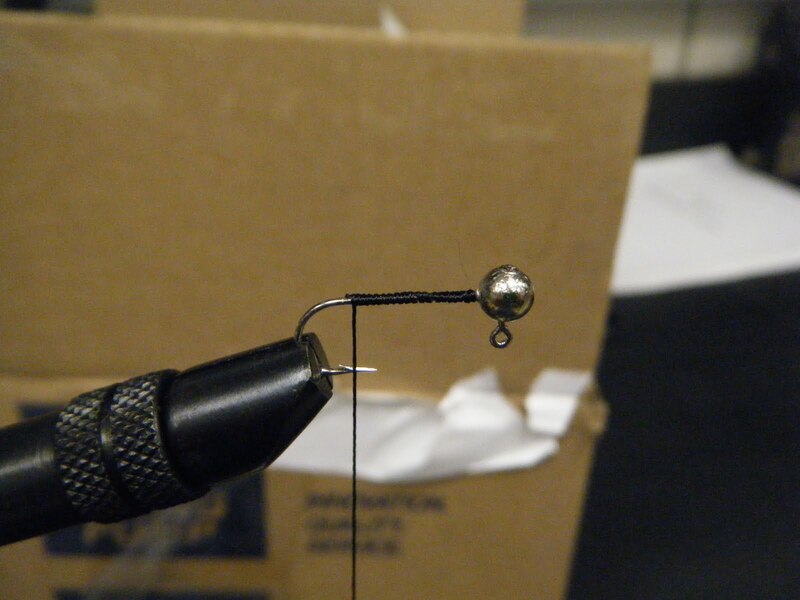 Next, place your jig in a vice, and wrap your thread onto the hook--bringing it back to a position that is slightly past the hook point. 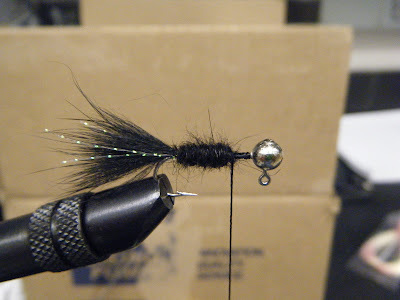 Then tie in your tail... For this jig I used some black rabbit fur and a few strands of pink Chrystal Flash, but you can use any material you want (marabou is another I use quite often). Last, you will dub in your body color/s (you'll see I used a combination of black and purple on this jig)... And then tie it off. This pattern can be made in any combination of colors. My favorites have been black and purple or pink and white, but any color combo can be effective depending on conditions and the mood of the fish. Man I am ready to go! The forecast doesn't look to good for Monday and Tuesday, which are the days we are planning to fish... But Dad and I were already rained out twice on potential trips this season, so we might just go ahead in spite of the forecast and hope for the best. 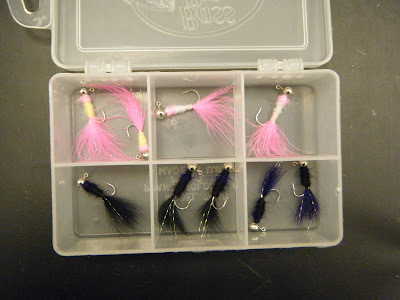 Now that I'm officially rigged up...here is to hoping my next entry has some pretty steelhead in it! Lol... :) Until then, thanks for reading and best of luck on the water.